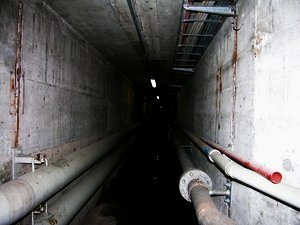 SCP-479 connects the D-Class laundry and steam plant room. Special Containment Procedures: A Site 14 standard 2mm CR4 double skin steel plate security door (UNI 9569 Class 3) with full gasket seal is installed on either end of Hallway 4. Both doors are to be kept locked, and keys retained by the ETHB on duty. D-class personnel authorized to enter for the purposes of surveying and research. Hallway 4 is no longer authorized as a thoroughfare between the D-class laundry and plant room. Sweeps of Site 14 looking for similar phenomena will continue to supplement regular security sweeps until further notice. Description: Hallway 4 is a 25m long hallway connecting the plant room in the Site 14 D-class dormitories to the laundry room. As of ██/██/20██, persons entering Hallway 4 have mentioned powerful visual, auditory and olfactory hallucinations of blood, ranging from isolated blood spots on the floor to "blood raining upwards, hitting the floor from the other side like it's the pane of a window". These visions of blood have been proven to be hallucinations. The floor at the time of the first report was plain bare concrete and no evidence of blood can be found by chemical or photographic means. Some ordinary rust was found, but not in the quantities or locations reported in the hallucinations. The ground under Hallway 4 is the same volcanic bedrock that the rest of Site 14 rests on, proven so after a D-class team excavated it with hand tools and a new reinforced concrete floor was poured. A thorough investigation of the walls and ceiling also turned up negative results. No abnormal chemicals are present. Neurological analysis of D-class subjects with no prior history is pending, but so far looks inconclusive. Antipsychotic medication is ineffective. The existence of this phenomenon in a Secure Facility may constitute a security breach and a report to O5 level is in preparation. A request is pending to authorize the funding to declare Hallway 4 a Containment Site, although at present there is no plan in place to deal with the effect, should it spread.